Apple just unveiled its biggest and best iPhone lineup to date. iPhone XS and iPhone XS Max come packing a brand new A12 Bionic chip with greatly improved performance and sound, as well as Apple’s best displays and even better designs. They can also juggle two SIM cards simultaneously. Meanwhile, the new iPhone XR delivers the flagship iPhone look and some of the best features from iPhone XS at a more-affordable price. iPhone X marked “the future of the smartphone,” Apple told us last September. It sacrificed beloved features like Touch ID in favor of an all-new design with a stunning Super Retina display and Face ID. It was a gamble that paid off for Apple. Despite its $1,000 price tag and controversial “notch,” iPhone X consistently outsold every other iPhone in Apple’s lineup since it went on sale last November. It also earned praise from fans and critics, and scored a 98 percent customer satisfaction rating last quarter. One year on, it’s hard to imagine going back to big bezels and buttons. It’s no surprise, then, that this year’s iPhones follow suit. The iPhone X has been retired. And in its place, Apple unveiled today the iPhone XS, iPhone XS Max and iPhone XR. They all look like last year’s flagship at first glance, with edge-to-edge displays and smooth glass fronts and backs — but they’re bigger, better and more powerful in every way. iPhone XS Max and iPhone XS. iPhone XS is “by far the most advanced iPhone we have ever created,” said Apple CEO Tim Cook during today’s Gather Round keynote. It’s available in two sizes: A 5.8-inch model that replaces iPhone X, and a 6.5-inch model that shows Apple hasn’t forgotten about iPhone Plus lovers. Both feature OLED screens with support for Dolby Vision and HDR10, with a 1-million-to-1 contrast ratio, 120Hz touch-sensing, True Tone and 3D Touch. They also offer a wider and richer stereo sound experience, Apple says. They’re the first iPhones to offer dual-SIM functionality, allowing users to juggle two numbers simultaneously. That’s thanks to a traditional SIM card slot and a built-in eSIM that can be connected to a whole bunch of supported carriers. In China, where the eSIM can’t be supported yet, iPhone XS and iPhone XS Max will ship with two SIM card slots. 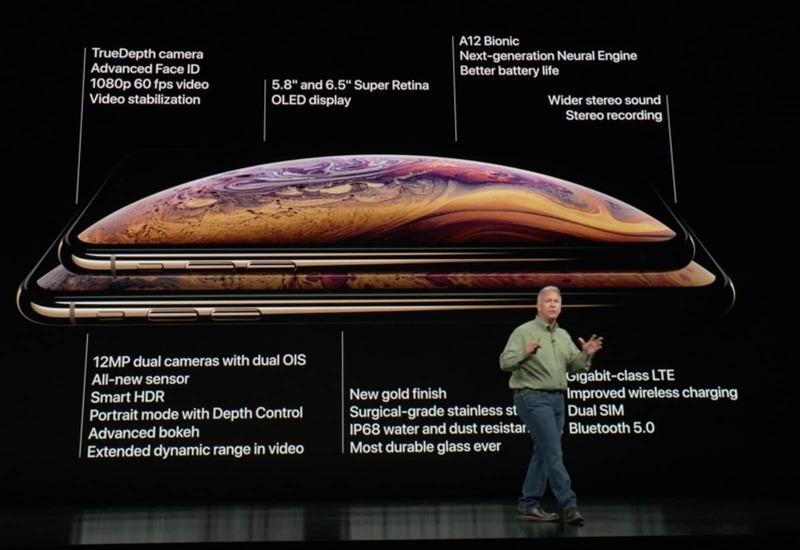 iPhone XS and iPhone XS Max are powered by an A12 Bionic chip — the industry’s first 7-nanometer processor. It’s packed with 6.9 billion transistors, with a 6-core CPU and a 4-core GPU that’s up to 50 percent faster. Apple has also introduced a new 8-core Neural Engine that’s dedicated to machine learning. Last year’s A11 Bionic was capable of processing 600 billion operations per second, but the A12 can process a staggering 5 trillion in the same time. This new Neural Engine allows for improved Portrait mode in the Camera app, even better Animoji, and more immersive augmented reality experiences. Face ID also works faster than ever before, thanks to faster algorithms and a snappier secure enclave. The iPhone is the world’s most popular camera. Apple helped its handset secure this crown by delivering the best smartphone shooters every year. The cameras packed into iPhone XS and iPhone XS Max are its best yet — and they deliver jaw-dropping results. Apple’s new iPhone XS cameras. 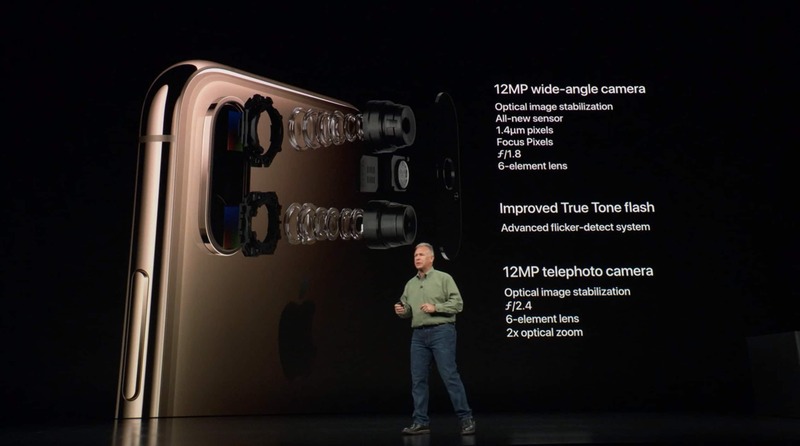 There are two sensors on the back of each device: one 12-megapixel sensor with a wide-angle lens and an f/1.8 aperture, and one 12-megapixel sensor with a telephoto lens and an f/2.4 aperture. There’s also an improved True Tone flash, and twice as many Focus Pixels. Thanks to an improved image signal processor, which works alongside the Neural Engine for the first time, the new iPhones can identify faces and bodies when you’re taking a photo and automatically apply adjustments like red-eye reduction. By far the most impressive feature of Apple’s new cameras is called Smart HDR. It works by capturing numerous frames every time you take a photo to get the best white balance, highlights, shadows, different exposures, and more. It then analyzes those images, picks out the best bits, and merges them to produce that “one perfect photo.” All of this happens at lightning speed, and it’s incredibly impressive. 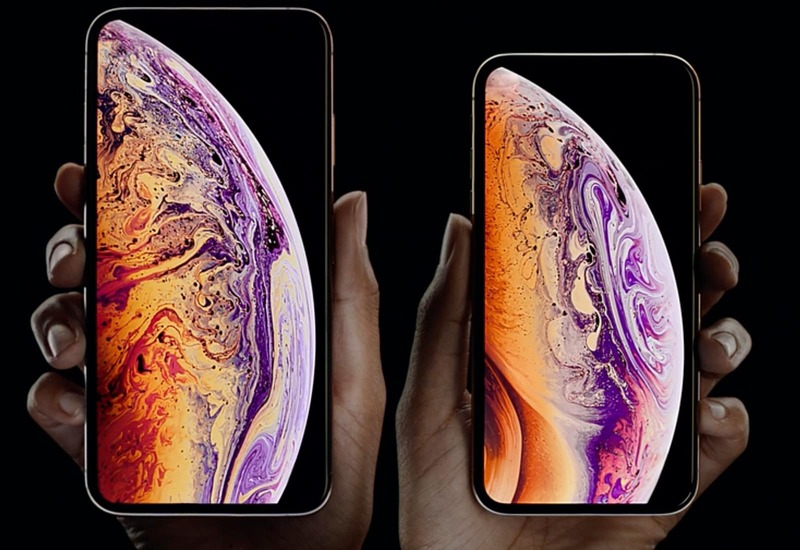 Both the iPhone XS and iPhone XS Max are protected by the most durable glass ever installed on a smartphone, and they have an improved IP68 rating for dust- and water-resistance. They also last longer than their predecessors in between charges. 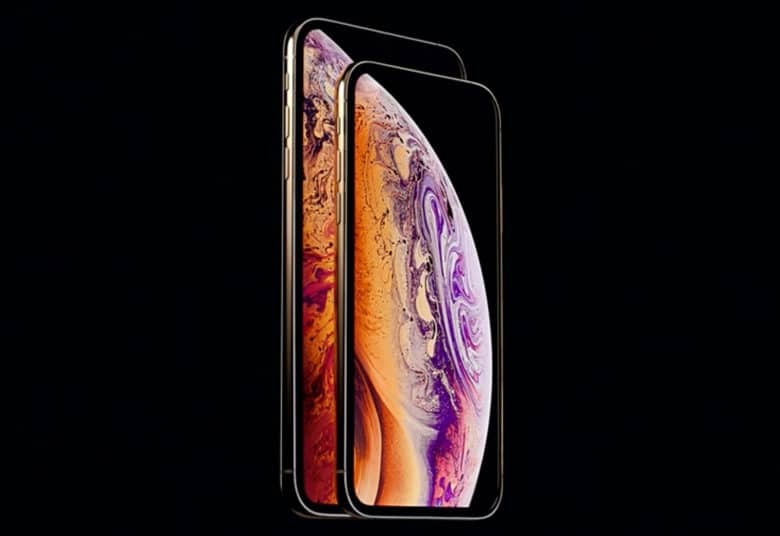 iPhone XS and iPhone XS Max will be available in gold, silver and space gray with up to 512GB of storage. Prices start at $999 for the smaller model, and $1,099 for the larger model. You’ll be able to order them this Friday, and they’ll start shipping September 21.
iPhone XR delivers the “iPhone X experience” at a more affordable price. It’s powered by the new A12 Bionic chip and sports a gorgeous edge-to-edge display just like its siblings, only this time, it’s an LCD screen. iPhone XR is a beauty. It’s the most advanced LCD ever packed into a smartphone, Apple says, and it’s called the Liquid Retina display. The screen measures 6.1 inches diagonally, making it bigger than an iPhone 8 Plus display, but the device itself is smaller. iPhone XR has just one camera, but it’s the same 12-megapixel camera found in iPhone XS and iPhone XS Max. That means you get the same great performance, optical image stabilization, and the improved True Tone flash. Apple even managed to deliver Portrait mode for iPhone XR, despite just one sensor. 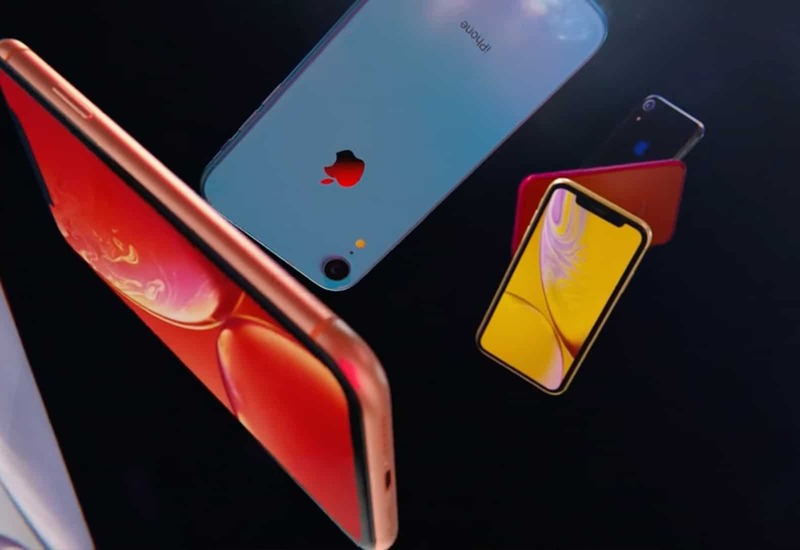 iPhone XR is made from 7000 Series aerospace-grade aluminum that’s finished in either white, black, blue, coral, red or yellow. It also boasts an IP67 rating for dust- and water-resistance. Prices start at $749 with 64GB of storage, but 128GB and 256GB models will be available. You’ll be able to order iPhone XR next month, and it will start shipping October 26.